The news coming out of Edgar Street today appears to show a determination by the board, at long last, to get the finances back on track. The sale, although probably for next to nothing, of Josh O'Keefe will save pounds off the wage bill as he is thought to be one of the highest paid players at the club. The likely scrapping of the Under 18 team, unless a sponsorship deal can be agreed which seems unlikely, will not go down well with some supporters especially given how well they have done this season. But it has to be faced, can the club afford the circa £100K it costs for the rewards it brings? Given the present financial situation, the answer is no. And more so since the rules about compensation for young players who then get picked up by wealthier clubs are so biased towards those wealthier clubs. In reality chairman David Keyte has no alternative to cuts in all areas. There's still a long way to go but it's a start. The club has to balance income and expenditure as quickly as possible. Hereford United are understood to have turned down an offer for captain Luke Graham according to the Stroud News. The offer is believed to have come from Kidderminster. Meanwhile Forest Green Rovers are said to be considering a cash bid for Graham who played for the Grumpers a couple of seasons ago. Any firm offer from Forest Green may depend on whether Eddie Oshodi moves to League One Brentford. And according to the paper, Wrexham are also interested in Graham. UPDATE 9.40pm: Hereford United have just said they haven't received any offers for players other than Josh O'Keefe who has moved to Kidderminster. However BN understands there was an 'enquiry' about Luke Graham. Forest Green have released goalkeeper Matt Bulman by mutual consent. He is the fifth departure from the Gumpers in January, having made only a handful of appearances in three seasons at the New Lawn. Dartford have extended the loan of Cambridge defender Rory McAuley to the end of the season, and have also signed Mikel Suarez from Tonbridge Angels. The striker has struggled for games with the Conf South side after an accidental collision in a game left him in a coma in 2012. Ex-Bull Gavin McCallum has been recalled by parent club Sutton from a loan spell at Tonbridge. The Canadian played four times for Tonbridge and scored once. Burton have recalled midfielder Jack Dyer from his loan spell with Kidderminster. He was due to return after the weekend, after five games with the Harriers. Tamworth have loaned goalkeeper James Wren to Cambridge City for an initial month. The former Bulls trialist hasn't made a first team appearance for the Lambs. Wrexham have signed defender Danny Livesey on loan from Carlisle. The 29 year old central defender has spent the last nine years with the Cumbrian side, but has made only 11 appearances this term. Aldershot have signed Luton midfielder Solomon Taiwo on loan for a month. The 28 year old has made only five Conference appearances since making his loan move from Mansfield permanent in the summer. The Shots have also agreed a loan extension for the rest of the season. The Bournemouth midfielder, 23, has played five times since arriving at the start of the month. Welling have signed defender Alfie Mawson on loan from Brentford. The 20 year old will spend the rest of the season with the Wings after previously having a one game loan spell with Luton. The Wings have also signed Charlton striker Tobi Sho-Silva on loan for a month, with the teenager having earned an England u18 call up last season, and signed fellow forward Toby Ajala on a permanent basis following his release by Bristol City. Woking have signed defender Joey Jones from Yeovil on a months loan. The youngster is yet to debut for the Huish Park outfit after signing in the summer. Barnet have loaned strikers Jon Nurse and George Sykes to Farnborough for initial month long spells. The pair have started only five games between them this season for the Bees. Gateshead have loaned midfielder Rob Ramshaw to Darlington for a month and released defender Dan Smith. Smith was transfer listed after brother Anth was sacked as manager, while Ramshaw has played 13 first team games this season but needs fitness after injury. Bulls midfielder Josh O'Keefe has joined Kidderminster for an undisclosed fee. The former Lincoln man scored against the Harriers in both games between the sides this term, and will earn the Bulls additional sums based on their final league position this term. The 25 year old has made a total of 51 Conference appearances for the Bulls, scoring 15 goals. O'Keefe has signed an 18 month deal. Meanwhile, the Harriers have let three players go. Midfielder Lee Fowler and wingers Dior Angus and James Dance have all left the club by mutual consent. The Bulls will axe their youth team unless it finds £65,000 in sponsorship to cover costs next season. The club says it expects the side to cost it that sum next term with central funding disappearing entirely, and that the decision has been made unanimously by the board. The club have put a deadline of February 17th for sponsorship talks to be 'in advanced stages' otherwise the club will pull the plug on the side that ran Man City close in the FA Cup this year. The full club statement is here (link). Some 'youth' players have already been told to try and find another club for next season according to a parent who spoke to BN earlier this week. “If negotiations with a potential sponsor are in not in advanced stages by February 17, the youth set-up at Edgar Street will not continue into the new season. “Whilst this is very disappointing, this was a unanimous decision made by the board. “The aim is clear: to focus all of the clubs efforts and revenues on the first team squad to provide a competitive playing budget whilst working to the break even budget. “The first-team playing budget for the 2014/15 season will be based upon forecasts that are derived from this year’s income." You can earn HUST up to £25 when you switch your electricity and gas supplier to Co-operative Energy. or by calling Co-operative Energy on 0800 093 7535, quoting “Supporters Direct”, and the advisor will ask which Trust you would like to support. You can also click on the link to see more about Co-operative Energy and why they are a different energy supplier. The transfer window closes at 11pm with the Bulls hoping for cash sales more than arrivals at Edgar Street to boost the coffers. The big news will likely surround ex-Bull Sam Clucas with the reigning Player of the Year rumoured to be the target of a string of Championship level clubs. His sale for a six figure sum will come as a welcome boost with another monthly wage bill to settle at Edgar Street. Several youth teamers are reported to be attracting interest after they ran Man City close in a high profile tie. The sale of one or more of the current crop may dictate the future of the youth department with budgets being slashed at Edgar Street across the board. Meanwhile, suitors continue to sniff around the Bulls' first team players with the defensive line getting the bulk of the interest after a series of impressive performances. It remains unclear whether the transfer embargo has been lifted at Edgar Street for any incoming business. While the official notice of the dismissal of winding-up proceedings would normally lift the embargo, chairman David Keyte has admitted further tax debt in recent statements and that may leave Conference chiefs nervous about lifting sanctions. Macclesfield have allowed midfielder John-Paul Kissock to join Oldham on loan until the end of the season. The former Bulls trialist, 24, started only seven games for the Silkmen after a permanent move to Moss Rose following a loan. The Silkmen have also allowed James Bolton to join Halifax on loan. The 20 year old defender hasn't played first team football since October. Forest Green boss Adrian Pennock says that rumours of him signing Rory Delap are rubbish, with the 37 year old not coming out of retirement. Former Mansfield directors Steve Hymas and Andy Saunders have offered the club a settlement in their legal row over nearly £1m in loans. They say they will accept £2,000 a month from the club, beginning from August. Dartford have extended the loan of Luton midfielder Jim Stevenson to the end of the season. The 21 year old has been a regular for the Darts since signing on loan in December. Woking have extended the loan of midfielder Kieran Murtagh to the end of the season. The 25 year old has made seven appearances for the Cards so far. Cambridge have signed young pair Will Norris and Liam Hughes to new two and a half year deals. Goalkeeper Norris has made one appearance this term as backup stopper, while defender Hughes has appeared in most of the U's games this season. Ex-Bull Alan Connell has signed for Northampton on a free transfer after rejecting a return to Grimsby. The 30 year old has signed for the Cobblers until the summer. Chester have signed Forest Green striker Matt Taylor on loan until the end of the season. The 22 year old has scored three times in 13 games for the Gumpers this term. Southport have released defender Brice Irie-Bi and allowed forward Chris Almond to join Chorley on a permanent basis. Both were bit part players during the first half of the season. Halifax have signed Ryan Crowther following his release from Fleetwood. The 25 year old midfielder played seven times in League Two this term, but was one of four released by Graham Alexander yesterday. Former Bulls loanee Mark Marshall is reported to be on trial with Coventry. The winger has served his two year ban for using a banned substance. Lincoln have signed Crewe defender Thierry Audel and Birmingham midfielder Charlie Adams on loan. Audel, 27, previously played for boss Gary Simpson at Macclesfield while teenager Adams had a spell with Brentford at the end of last season, making one appearance as a sub. The Imps have also handed young striker Connor Robinson a new two and a half year deal, and agreed a fee with Cambridge for loan striker Sam Delano-Yorke. Woking FC, known as The Cardinals (or simply The Cards) were formed in 1889 and spent much of their early years in the Isthmian League. The 1990/91 season saw them reach the third round of the FA Cup beating West Baggies Albion at The Hawthorns to set up a fourth round match against Everton. Drawn at home, The Cards agreed to switch the match to Goodison where they were defeated by a single goal scored by former Bull Kevin Sheedy. Promotion to The Conference was achieved in 91/92 under the guidance of long term manager Geoff Chapple and despite being relegated in 08/09 they bounced back the season before last as Conference South Champions. They are currently managed by the thrifty Garry Hill formally of Hornchurch, Weymouth and Rushden & Diamonds. Kingfield has a capacity of 6000 with 2500 seats the majority of which are in the remarkable Leslie Gosden Stand at one end of the ground. Woking often do not enforce segregation but if it is the case then the uncovered Chris Lane Terrace will be made available to Bulls’ supporters with some seats in the Bellway Homes Stand opposite. Admission is believed to be £15 for adults, £10 for over 65’s/students and £3 for U16’s. BY CAR – Gloucester, Swindon to join the M4 east (sign London). Leave the M4 at J10 to join the A329M (sign Bracknell) and continue onto the A329 (sign M3 Ascot). Then continue onto the A322 (sign Bagshot). After crossing the M3, take a left onto the A319 (sign Chobbam) and in Chobbam take the A3046 (sign Woking). At the junction with the A320 (Traffic signals) turn right onto the A320 and then bear left (sign Guildford). Continue on the A320 for a little under a mile and then turn left into Claremont Avenue (A247 – sign Dorking/Old Woking). The ground will be visible on your right. If you choose to use the M25, you should leave at J11 and take the A3 towards Guildford before joining the A320 to Woking and following the above. PARKING – There is parking at the Leisure Centre opposite to the entrance to the ground but it does fill some time before KO. Also, there is some street parking in nearby Westfield Avenue or a multi-storey in the town centre (15 minute walk away). TRAIN – Woking station is about a mile from the ground and is served by trains from London Waterloo. ALEHOUSES – The Cardinals Bar at the ground is available for non-segregated games. The nearest pub is The Kingfield Arms on Kingfield Road towards Old Woking. In the town centre is a Wetherspoons called The Herbert George Wells on Chertsey Road and The Sovereigns on Guildford Road, which I have previously found more than acceptable. For those wanting somewhere nice to eat I’d suggest The White Heart in Chobbam. A Petition to wind up the above-named Company, Registration Number 00355272 of Edgar Street, Athletic Ground, Hereford, HR4 9JU, presented on26 November 2013 by the COMMISSIONERS FOR HM REVENUE AND CUSTOMS, of Bush House, Strand, London, WC2B 4RD, claiming to be Creditors of the Company was advertised in The London Gazette on 8 January 2014 and heard at the Royal Courts of Justice, 7 Rolls Buildings, Fetter Lane, London EC4A 1NL, on 27 January 2014 . Mansfield boss Paul Cox says he is still waiting on bids for ex-Bull Sam Clucas. He told the local press: “I have not had a phone call or any enquiries for Sam yet, but 24 hours is a long time in football. I would like to just switch my phone off, but I can’t do that. “Sam is a lovely kid and works extremely hard. I am sure at some point he will make the step up. He is on a learning curve and I want him to stay with us and make the next part of his journey with us. Clucas played 40 minutes in his return match from injury at the weekend, but the Stags' saw their home game on Tuesday night called off due to the weather. Bulls captain Luke Graham is holding a Question and Answer session on his blog. Luke says: I will be calling on all Football Fans over the final weeks of the season to give me their views on the beautiful game. Firstly I am giving you the opportunity to ask me ANY question you like and I will do my best to answer as honestly as I can. The person I feel gave me the best question to answer will receive two tickets for Hereford Fc’s upcoming game against Macclesfield on Saturday 8th February at Edgar Street. Don’t worry if your not a Hereford fan, you can still come up and support us, besides we need some extra income on programme and food sales! Leave your question for me to answer in the COMMENTS thread and deadline is by 10pm tonight. Forest Green have offered new deals to midfielders Marcus Kelly and Yan Klukowski, and keeper Sam Russell. The trio are out of contract in the summer with rumours that Kelly has interested his former Oxford boss Chris Wilder for Northampton. Woking will sign former loanee Jack Marriott on another loan spell from Ipswich after the striker was recalled from Gillingham after just one sub appearance. Chester chairman Tony Durkin says a partnership with a local college will allow the club to make the transition to full time status. The club are also planning a community facility with up to eight pitches to act as a training facility. Kidderminster boss Andy Thorn has admitted that striker Anthony Malbon is likely to go out on loan, claiming the player isn't fit enough for their promotion challenge. Lincoln chairman Bob Dorrian says he will quit the club if someone will guarantee £500,000 of investment to ensure the club's immediate future. Dorrian will face a fans forum tonight, admitting that he will face a grilling. Gateshead have signed teenage defender Jordan Holt until the end of the season. The 19 year old has just had a six month deal with Notts County expire, having made two first team appearances for the League One side. Luton have released striker Scott Rendell by mutual consent, and he has signed for Woking until the end of the season. The much travelled 27 year old netted seven times in 16 games with the Cards on loan during the first half of the season, and had spent the last couple of weeks on trial at Torquay. Ex-Bull Phil Marsh has extended his loan spell at Barrow until the end of the season. The former Forest Green man has spent the last two weeks with the club. Tamworth have released ex-Bull Jordan Rose, with the defender struggling for fitness following an operation. The 24 year old hasn't played since September and is expected to miss the remainder of this season. Gateshead have extended the loan of Luton midfielder JJ O'Donnell to the end of the season, with the 22 year old playing twice since arriving at the International Stadium earlier in the month. Forest Green striker Andy Mangan is reported to have been suspended by the club for an undisclosed internal disciplinary breach. The 27 year old is wanted by former club Wrexham, but his £3,000 a week wages cannot be met by the Dragons. The Gumpers are also reported to be on the verge of signing veteran midfielder Rory Delap. The 37 year old retired from playing with Burton last month but is interested in rejoining former Stoke coaches Adrian Pennock and Dave Kevan. Newport have recorded a trading loss of over £600,000 in securing promotion from the Conference last season. The £606,032 figure is cut down to around £350,000 after transferring historic debt to shares and cash, paid out by Chairman Les Scadding. The lottery millionaire put nearly £400,000 into the club to cover debt payments and player transfers, with the club spending just £750 on incoming transfers thanks to Scadding's input. The Exiles reported a player budget of nearly £950,000 - up by nearly 50% on the previous season - and over £200,000 on other wages with a turnover of £1.2million. Last night before the match against Kidderminster at Edgar Street, the Hereford United Supporters Trust took it’s 400th member, with current membership totals now standing at 335 Adults & 68 Juniors. In the 5 months since our launch night we never envisaged gaining so many members so quickly and are glad that we have the support of so many Hereford United Supporters. The 400th Member to sign up was a Mr A Woodhouse from Newport Isle of Wight, he joins HUST members from across the world from all walks of life, including former players such as Ben Smith & Ricky George, HUFC Directors & Local MP Jesse Norman to name but a few, with members supporting us from around the globe, including Australia, New Zealand, USA, Canada & Mainland Europe. We appreciate every single one of our members and love hearing from you all to gauge opinion of how we should be operating. If you would like to get in contact with us, please email us using any of the email addresses on the contact us page or for individual board members please contact them using the links under the ‘About the Trust’ tab. In the meantime, we would like to confirm that we have recently added to our shareholding in Hereford United Football Club on the request of our Members. Conference clubs have rejected the idea of using 3G pitches in first team matches at today's EGM in Telford. Just 11 votes of the 32 available voted in favour of the use of plastic pitches, with each Conference Premier club getting one vote and the North and South divisions getting a four vote block each. The matter was on the agenda with Maidstone on course for promotion from the Ryman Premier. The reformed side, who exited the Football League through bankruptcy in 1992, have a 3G surface at their Gallagher Stadium home and are currently one point behind leaders Dulwich Hamlet. Meanwhile, the Conference have signed a media distribution deal with At The Races subsidiary Sports Mediastream. The deal will see the live BT Sport matches available worldwide, predominantly aimed at the betting industry, with ATR currently holding content deals for UK sport in 30 different countries. The agreement will also see Conference highlights and archive footage used on ATR's UK channel in betting previews. Hereford United manager Martin Foyle felt last night's drawn game against Kidderminster was a 'good advert for Conference football. "I thought that was advert for Conference football on a tricky surface but I wouldn't have said it was a bad surface," Foyle told BBC Hereford and Worcester. "I thought both sides had a good go at each other and I thought a draw was a fair result." "It was exciting, it was end to end. "When we took the lead to be honest I thought we were going to win the game. They didn't really create anything. "Ranks got caught for their goal, he has defended great for me all season. Just that one mistake." "All I can remember is Josh around the back stick heading it back into the goal. A good finish from a hard angle." The game nearly didn't go ahead as heavy rain fell on the pitch around 6pm causing the referee to have an inspection. However the rain eased and with the exception of an area close to the dug-outs the pitch coped well. "I find that so hard, there was no problem at all. "We had a little bit of rain just prior to kick-off but there shouldn't have even been a pitch inspection. "The game is so soft now." Southport have released midfielder Jamie Milligan by mutual consent. The 34 year old hasn't played in the three games since he was subbed off just after half time in their draw with Hyde, having been a virtual ever-present beforehand. Ex-Bull Alan Connell is expected to join Northampton rather than Grimsby, according to Bradford boss Phil Parkinson. Former Bulls loanee Chris Palmer is the latest ex-Bull through the doors at Tamworth. Now 30, former Derby trainee Palmer had been playing for Oxford City after leaving Burton in the summer. Grimsby have signed Stevenage forward Oumare Tounkara on loan for the remainder of the season. The 23 year old Frenchman debuted as a sub last night after 17 goalless games for the League One side so far. Stockport's shirt sponsors have applied to the FA to set up a new semi-professional club in the town. The owners of the nearby Stockport Sports Village, already home to semi-pro side Stockport Sports, would house the new side if accepted into the NWCL with a decision due in March. Ex-Bull Waide Fairhurst has joined former club Macclesfield on loan for a month from Lincoln. The 24 year old made the reverse move in the summer but has started only five games since. A selection of pictures from last night's 1-1 draw between Hereford United and Kidderminster Harriers. Cambridge failed to take advantage of their game in hand over leaders Luton, going down 2-1 at home to Grimsby last night. The loss leaves the U's three points behind the Hatters having now played the same number of games. The Mariners are up to fourth, 12 points behind the Hatters with two games in hand. Nuneaton are up to fifth after beating Aldershot 2-1, while Wrexham are five points short of the play-offs following their 2-0 win over Tamworth in front of a disappointing 2,160 gate at the Racecourse. After expecting an easy ride at Edgar Street last night, Kidderminster fans are acknowledging that new boss Andy Thorn might not be the man their board had hoped for. Their report, in full on their site here (link), ended with a call to Thorn: 'Drop these negative tactics. Get someone up alongside Gash to help him out and one day, just one day, we might show the spirit and endeavour that saw us thrash Peterborough in the second half of the recent cup tie. The Bulls final game of the season, away at Aldershot, will kick off at 5.30pm. The whole of the final day programme will kick off at the same time with BT Sport covering one match live. It is the first announcement of the day of a Conference EGM, with the 68 member club's chairmen and managers present. Managers, including the Bulls' Martin Foyle, will have a speech from former Scotland coach Alex McLeish. The chairmen have a number of issues on their agenda, with the use of 3G surfaces in first team competition one of them. The Conference will also be unveiling it's new mobile app at 11am on it's website. Hereford United goalscorer Josh O'Keefe felt the Bulls battled well in their draw against Kidderminster last night but admitted Kidderminster were a good team. "Kidderminster are a good team,"O'Keefe told BBC Hereford and Worcester. "I think we battled well. "The last few weeks there has been an increase in tempo from us. "The fans have been brilliant as well. "I think we could have gone and got three points but in the end we settled for a point." Following a recently improved home record, the Whites remain 5 games unbeaten for the first time in 7 years. Taking this into account, Martin Foyle sent out the same team that beat Salisbury on the weekend. Despite the Harriers kicking off, the Bulls were the first team to show intent on goal. After some decent build up play, Josh O’Keefe was unlucky not to grab an early opener, when his shot went just wide of the upright. Kidderminster’s Lee Vaughan was fouled 22 yards out by left-back Bush and Dyer delivered the ball into the heart of the box. Michael Rankine did well to head the ball out for a corner, which Lloyd-Weston tipped over the bar from close-range. A third and final corner was to follow, and this was easily cleared by Hereford. Josh Gowling then conceded a corner when he overhit his back-pass. Walker’s inswinger was met by O’Keefe’s head, but he sent the ball wide to keep the scores level. Chris Sharp showed skill and determination down the left-wing, and got the ball past 3 markers. He carved out a pass to Rankine, who then lost possession in the danger area. More chances were to follow for the Bulls, especially when Bush utilised the left wing to whip in a cross. After being knocked around in the box, the ball fell to the feet of Walker. His shot was deflected out for a corner. The resulting corner came to nothing more than a goal kick. Frankie Artus had a great chance to put the Bulls ahead, when he received a cross ball by Rankine, but Artus’ right footed short was too high to trouble visiting keeper, Danny Lewis. Following a decent period of United possession, the Bulls won an attacking throw which Chris Bush took. His trademark long throw was dealt with by the Kidderminster defenders, and went out for a corner. Walker’s low corner into the box was easily cleared by Vaughan. A final chance of the first period fell to Artus, after Bush took a free kick short to Aruts, following a foul on Sharp. Artus chipped the ball goal-bound, but Lewis was there to prevent the hosts taking the lead on the stroke of half time. Walker was then replaced during the break, reportedly due to a hamstring injury, by youngster Jamie Edge. After looking positive on the attack, Kidderminster’s Storer crossed the ball to the onrushing Ladapo, who just failed to get a touch and the ball ran harmlessly out for a goal kick. Substitute Edge crossed the ball to Sharp, who then managed to win a United corner. Edge’s initial corner was delivered low but was knocked out for a second corner, this one looked more promising, as O’Keefe tried a tight pass along the goal line, but Graham couldn’t quite keep the ball in play. As Hereford looked to be becoming stronger in their attacking play, Brown's cross into the box was deflected out for a corner. Artus’ corner was headed away, but only as far as Brown. He tried his luck with a volley from 18-yards, but his shot was too high to trouble Lewis. United broke the deadlock on 61 minutes, when a Rod McDonald cross from the left, was met by O’Keefe and his looping header back across goal and into the net - putting United one up. The lead wasn’t to last though, and just 4 minutes later, Kiddy were back even. A floating Harriers free kick found Gowling unmarked on the edge of the box. Rankine failed to make a challenge, and the ball was powerfully headed into the corner of Lloyd-Weston’s net. 3 consecutive corners for the Bulls were to follow with the best chance falling to Brown but his shot from 18 yards was deflected just wide of the upright. In the 4 minutes injury time, Edge’s attempted cross was deflected out for a corner. The low corner from Artus was hit goal bound by Collins, but his effort was blocked, and his follow up shot forced Lewis into making a fine save. Att: 2,014 with 340 from across the border. Sponsors’ MotM: Goalscorer Josh O’Keefe. Hereford: Lloyd-Weston, Collins, McDonald, Graham, Bush, Walker (Edge 46’), Artus, O’Keefe, Brown, Rankine, Sharp (Leadbitter 70’). Subs not used: Purdie, Smith, Williams. Kidderminster: Lewis, L Vaughan, Gowling, Demetriou, Jackman, Dyer (Gittings 66’), Storer, Ladapo (Morgan-Smith 54’), Byrne, Cieslewicz, Gash. Subs not used: Dunkley, N Vaughan, Aloi. This is United’s best home form since 2006, and with a bit more composure in front of goal, could easily have won again this evening. Although, on the balance of play, a draw was probably the right result. But, at the end of the day, it’s another point closer to safety. Up next, it's Woking away on Monday night, time to see if we can carry this good form away from home. All the main stats from this evening's Conference match between Hereford United and Kidderminster Harriers. The Bulls drew 1-1 with Kidderminster in today's match at Edgar Street. Josh O'Keefe netted with a looping header before Josh Gowling equalised shortly after. BBC Hereford and Worcester will be live from Edgar Street this evening with coverage of the whole of the Hereford United/Kidderminster game. They will be on the air from 7.05pm on all frequencies and also on the internet. Bulls Player will also cover the game from around 7.40pm. Meanwhile the bookies continue to favour Kiddy to win the game. The Non-League Paper's masked columnist The Secret Footballer has directed his latest column at the Bulls' financial problems. He writes: 'As a player, you have to try to put the off-field activities to one side and solely focus on your responsibilities on the pitch. It is hard, though, if not next to impossible. It’s times like this when the best players take the club and community into their hearts. After all, they sign up for the job because they find something which attracts them to the club, whether it be the location, the manager, money, security, the style of play or future plans. Even away from the bubble of a footballer in which we are so wrapped and fixated, this scenario happens all the time in everyday life. People lose their jobs and move on due to companies closing down. In this case, it’s not just a business. It’s a community and an important part of the local area, where people come to meet friends, socialise, have a dodgy burger and share the same experiences. It’s a place where you are all as one; a place at which, I’m sure, the other worries in life are withdrawn for 90 minutes. This is the passion, from the supporters, that I have found in Non-League. They pay our wages but, more importantly, give us a reason to be able to play professionally the game we love. Clubs have gone but have reformed, run by the fans. The full column is on the NLP website here (link). Luton have signed defender Jernade Meade on loan for the rest of the season from Swansea. The 21 year old former Arsenal trainee is yet to make his league debut. Ex-Bull Stuart Fleetwood has signed a new deal with Eastleigh to keep him at the Conf South side until the summer of 2015. Fleetwood has netted eight times in 26 games so far this season. Hayes and Yeading have been given permission to continue building work at their new stadium after a lengthy delay. The Conf South side are groundsharing with Woking after a dispute with the contractor saw work halted, but they have now been given permission to continue work with another company while the dispute continues. Lincoln boss Gary Simpson wants to make Cambridge loan striker Sam Delano-Yorke a permanent signing at Sincil Bank. Ex-Bull Mathieu Manset has resurfaced in the second tier of Belgian football. The 24 year old has signed for Royal Antwerp, whose manager is Jimmy Floyd Hasselbaink, and was one of two players sent off in their weekend loss to Tubize. Luton have signed former loanee Pelly Ruddock on a permanent deal from West Ham. The defender was recalled from his loan spell with the Hatters due to injuries. Barnet keeper Nick Jupp has signed a new deal with the club keeping him there to the end of the season. The 24 year old has made five appearances in the last month after first choice Graham Stack picked up an injury. Kidderminster are looking to chase Conference leaders Luton for the top spot now they are out of the FA Cup. The cup run has detracted from their league form but having axed manager Steve Burr new boss Andy Thorn was told that promotion was their sole aim this season. Thorn has already signed three players with Joe Lolley leaving, and rumours of further changes in the Harriers camp abound with claims that both striker Anthony Malbon and midfielder Lee Fowler are heading for the exit door - with Burr's Chester the claimed destination. Malbon, who netted 19 times last season and six this, has made only three sub appearances in the last seven games, while Fowler sat out the FA Cup game at Sunderland with fans suggesting it wasn't due to the claimed injury that is also reported to keep him out of tonight's game. Thorn will have midfielder Callum Gittings back in contention for a starting place after a shoulder injury, while winger Adrian Ciezlewicz returns to the squad after being cup tied. Latest signing Freddie Ladapo will also be in contention after debuting as a second half sub at Sunderland. The 20 year old played at Edgar Street earlier in the season as a late sub for Nuneaton. Meanwhile, the Harriers Online fan site helped Martin Foyle with his pre-match motivation with their match preview. It is reported that the pitch is OK for tonight's game, with no reports of rain ahead of kick-off. 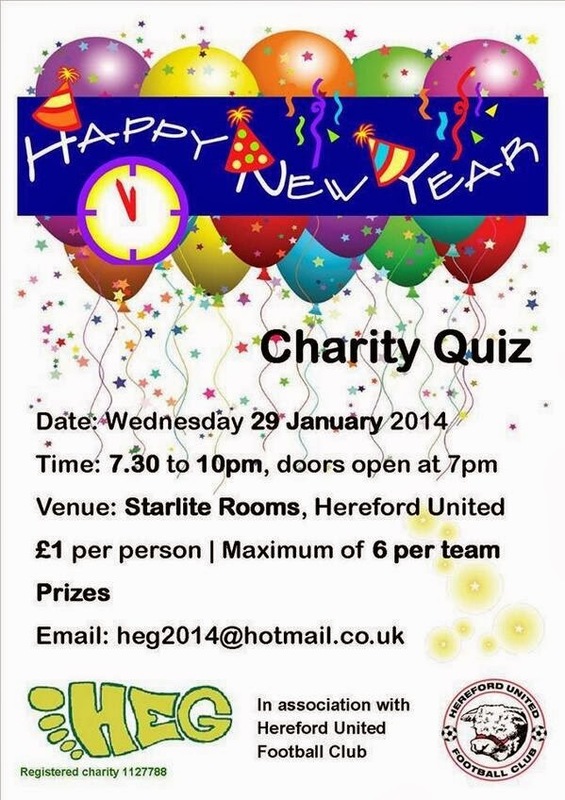 The Met Office predict that Hereford will be dry until 9pm, with light winds, and the club say the pitch is fine. Meanwhile, the club say that Saturday's kit sale raised £1,005 for the club. Kidderminster Harriers have a somewhat shorter journey tomorrow evening, compared to last Saturday, when they travel to Hereford United for a Conference fixture. "But we've come in this morning and got ourselves prepared for Hereford and everyone is looking forward to it. "It's a great opportunity to get back and get the scoreboard rolling again. "We'll prepare accordingly and try and get a result." Meanwhile Hereford United manager Martin Foyle is expected to stick with the same starting eleven that defeated Salisbury 1-0 last Saturday. The Bulls have won their last four home games. It was a long week but a good week for the club and the players,” Thorn told Harriers Player. “We were disappointed with the final outcome but that’s gone now and we can focus on the league going forward which we have been doing today. “There were a lot of positives to take out of Saturday but we have come in this morning and got ourselves prepared for Hereford and everyone is looking forward to it. “The week we’ve had can be draining so it’s important that we keep on the front foot – it’s a great opportunity to get back and get the scoreboard rolling again. The Trust has been asked by the club to put out a request for volunteers to hold a bucket collection at tomorrow night’s game with Kidderminster. Any volunteers are asked to attend the Club Reception at 6.45pm to receive instructions and buckets, with the task completed before kick-off. Meanwhile, the Trust membership table will be in the VP Club foyer again from 6.30pm until 7.30pm, while Trust Vice Chairman Martin Watson will also be in the VP Club after the match for any questions and queries. The likelihood of Sam Clucas leaving Mansfield this week has increased after the Stags announced a cut in spending. Blaming the recent move to reclaim loans by two former Directors, a club statement tells fans that funds originally scheduled to fund new signings this week have been withdrawn and directed towards the legal bill they say they will run up. Also cut is a planned pre-season trip to Malta. Ex-Directors Steve Hymas and Andrew Saunders are claiming around £1million in loans they made to the club. Rumours persist that Nottm Forest have lodged a £250,000 offer for the player that was valued at £20,000 by a tribunal only four months ago. The Bulls' 15% cut would be worth around £35,000. Seats for the coach to Woeking can be booked in Radford’s before Tuesday’s home game against the Carpetmakers or through The Club office (08442 761939). Departure is set for 2.00 pm with a fare of £19 (non-members £21).